A masquerade ball. A second chance at love. Darcy's determination that Elizabeth will be his. . .
Elizabeth yearns for forgiveness. In her heart she knows she unfairly judged Darcy, but has no hope of ever seeing him again. Even were they to meet. . .his good opinion once lost, is gone forever. In real life, there are no second chances at love and happy marriage. Darcy knows Elizabeth's heart is within his reach when he catches her whispering a sweet plea for forgiveness in front of his portrait. His entire body clenches, and he vows that this time he will not let her go. Instead, he will turn the full force of his will on convincing her that their passion is worth giving way a measure of pride. . . Despite her best intentions, a sensual night at a masquerade ball places Elizabeth entirely at Darcy's mercy. She trusts him to be an honorable man. . .but only the next morning will truly tell. Has she misjudged his intentions a second time? 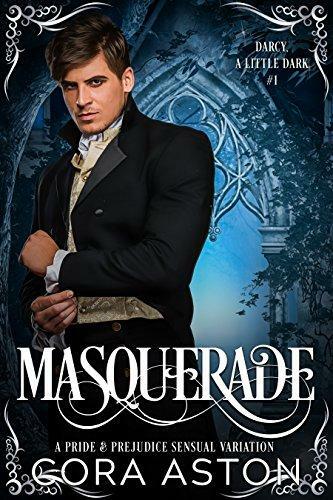 Masquerade is a Pride and Prejudice sensual variation novella to be read in one steamy sitting. Featuring a slightly more intense Darcy, a passionate scene and, of course, a HEA. This variation explores what might have happened had ODC succumbed to passion at Pemberley.